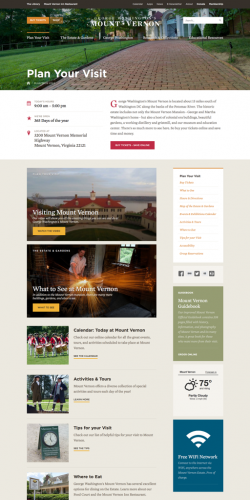 For Mount Vernon, the site has been a game changer, taking the organization from a relatively staid and uninspiring online presence to one that is represented by a vibrant, modern site. 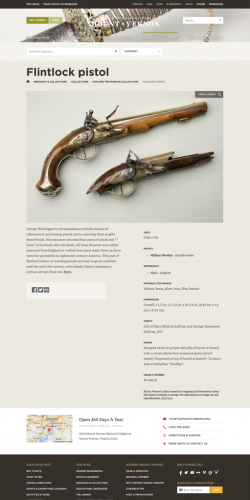 Fastspot and George Washington’s Mount Vernon partnered on a website redesign that launched in the summer of 2015. 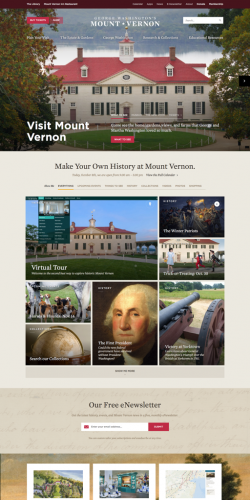 For Mount Vernon, the site has been a game changer, taking the organization from a relatively staid and uninspiring online presence to one that is represented by a vibrant, modern site. Now that it has been live for just over a year, we asked Rob Shenk, Senior Vice President for Visitor Engagement, to join us for a conversation about key audiences, critical decisions, and the continued challenge of managing a beautiful, content-rich site. Rob, what can you tell us about how this redesign project originally came together? 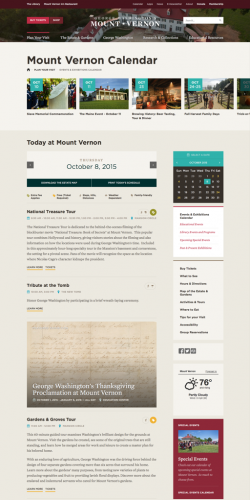 RobMount Vernon has a long-storied tradition of great visitor experience on the estate. From a physical point of view, we felt we were pretty top-of-class. But in the digital category, we were anything but a leader. "From a physical point of view, we felt we were pretty top-of-class. But in the digital category, we were anything but a leader." In fact, we were really pretty dysfunctional. Our new President & CEO, Curt Viebranz arrived about three years ago, and he made digital a much higher priority and created the new media team. One of the initial concerns was that maybe, as an organization, we weren’t ready to be bold digitally. But I found the opposite to be the case at Mount Vernon. Everyone from the Ladies, our donors, our leadership, down to the front line staff recognized the great opportunity we had in expanding our digital reach. Tracey, what were your first impressions of the project? Tracey We knew it was going to be complex because of all the different audience types. We knew we had to convey a strong sense of place. And we knew it needed to be organized in a way that the growing team at Mount Vernon could manage it. We immediately got a lot of positive encouragement and enthusiasm from Rob and his team to be the best partner that we could. We felt right away that it was going to be a good match. Let’s talk a little bit about those different audiences for this site. RobAs with many other sites in our category, there are really two distinct audiences – visitors and learners. The first group is very focused on logistical details of how and when they can visit you, what’s on your calendar, and what they can see and do at your site. 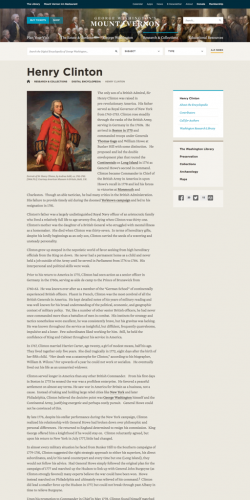 The second group, comprises a growing audience of people, worldwide, who are hungry for information on George Washington, the Mount Vernon estate, or the world that George Washington lived in. This latter group can be very mission focused and tend to arrive via targeted Google searches. TraceyWe found the different audiences to be one of the really exciting aspects of the project. 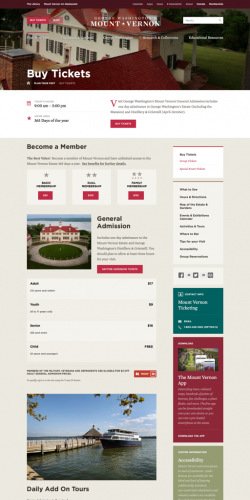 You have people who are lifetime members and see Mount Vernon as part of their home and their physical space. We didn’t want to alienate any historic audiences or older audiences, but you also want to attract newer (sometimes younger) audiences who don’t know as much about the estate. And of course you also have to think about internal people. You want them to feel part of the site development and be excited about it. There are a lot of emotions involved. You can’t alienate people with a website redesign, even as you’re encouraging a client to consider very new directions. "You can’t alienate people with a website redesign, even as you’re encouraging a client to consider very new directions." Was it difficult for you to build consensus around one solution with internal teams who have different areas of focus? RobIt wasn’t all that difficult. Because digital had not really been a focus of the organization I don’t think there was much vested interest in our digital platforms at the time. Maybe the bigger challenge was in generating interest in creating digital content and in empowering more people across the organization to be true content creators. Before the launch of the new website we were on a Drupal platform and there was literally one person in our organization who was able to update the site. One. Launching this new and beautiful website was a major step for us, but I can tell you, the improvements on the back-end are as fundamental and significant as anything we did on the front-end. 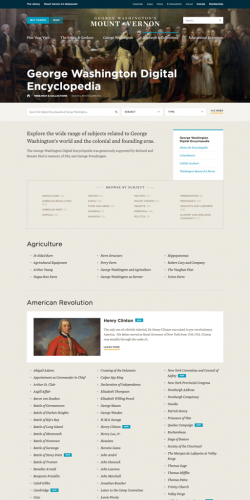 Our adoption of the BigTree CMS gave us a highly usable platform to create and curate content on our site. Without that tool we would be so much further behind than we are today. TraceyWe work hard to empower clients to become more effective communicators and storytellers and marketers with their digital audiences. And we can’t do that if we don’t give them a really amazing CMS system. We spent some time showing BigTree to the Mount Vernon team, talking about what it could do, connecting with their people that had technical questions, and really just explaining why we thought it was a really good match for the kind of team they had and the kind of team they were building. I have to say, Rob, your team has done a great job keeping it up and taking advantage of all the things we hope someone will take advantage of with a really good CMS system in place, because it’s always really vibrant and different and timely and engaging to look at. RobYou can’t really see CMSs of other institutions, so a CMS is kind of a hidden asset. I can remember seeing Big Tree for the first time and we were really blown away, ‘Wow, that’s really going to enable us to do so much more and be much more confident in all the content creation to come. I always like to tell people that launching a website is not the end. It’s really a beginning! You’ve got to really think through how you plan to operate this site. There are a hundred things you won’t get quite right day one, but a good CMS and continued focus on data gives you the means to quickly iterate your way forward. Without that iteration you never really match your full potential. Were there concerns about the fact that BigTree is not as widely-known as some of the other open source systems out there? RobWell, yes… we had never really heard of Big Tree and like others we wondered if it was the answer that we were looking for. Now that we’ve been operating BigTree for a year, all of our concerns have evaporated. Overall we’ve had just a fantastic experience on BigTree and regularly recommend it to others. TraceyWhat’s interesting about the CMS space from my perspective is that there are probably a million of them out there. There are these giant, dominating names like Drupal and Wordpress that float around, and I think that there’s safety in choosing one of those. You think, ‘Well, that’ll be easy to support because there will be so many people who will be familiar with it.’ The whole reason we created a CMS back in the day and then released it as an open-source platform (which is what we did with BigTree) was because we had so many clients having frustrating experiences with these so-called popular platforms and universal platforms. 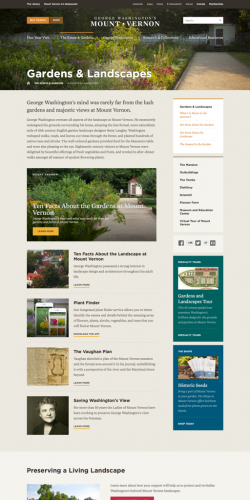 Getting back to the Mount Vernon website, let’s talk about the launch. RobTo me, the exciting moment came when we turned on our live tracking systems. You could see the energy coursing through this new site as people began to explore it. From a usability and navigation point of view it was quite clear that this was truly the improvement that we were looking for. And later we came to see that this new site really improved our search rankings which in term produced a whole new stream of visitors to our site. A year later - and thanks to Tracey and the team - we learned that we received this W3 Gold Award for the site. For an organization that had been a digital laggard, it was so gratifying to receive this sort of recognition for all of our hard work and it is truly the fruit of this remarkable partnership we have with Fastspot. Website are almost like living organisms. They need to be constantly fed and tended to. Change and iteration is a necessary part of ensuring that your digital platforms remain vital. Some might find all that constant change unnerving, but I find it to be one of the fun challenges of this job. We’re constantly looking at the data and analyzing the performance of our site. Our New Media team and experts from across the estate are all now engaged in making our site just a little better on a daily basis. 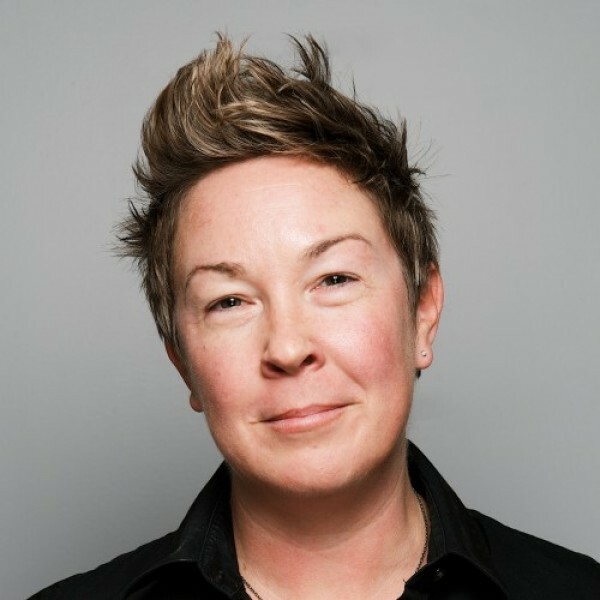 Tracey, how can our team help prepare clients to successfully maintain a website? TraceyA lot of our initial research and discovery work is oriented around meeting with different teams and understanding what their needs are so that we’re not just designing in a vacuum. We’re really talking to the different groups about specific needs. When the website starts to take shape and it’s time to train people on the CMS side, we’re presenting solutions to problems or opportunities that have already been discussed. They understand what they’re seeing. We try to flow the feeding process of the website into everyone’s natural workflow. We really do take a lot of care and concern around that and I think that shows in how client’s teams use the sites after launch. "I was just looking at the metrics, and just in terms of year over year growth, we are up 50% in terms of website sessions and 60% in terms of page views since the launch of our new site in August 2014. Video consumption and mobile performance are also vastly improved." And where does Mount Vernon go from here? Is the journey complete? RobI was just looking at the metrics, and just in terms of year over year growth, we are up 50% in terms of website sessions and 60% in terms of page views since the launch of our new site in August 2014. Video consumption and mobile performance are also vastly improved. And on top of all the quantitative improvement, we feel that with new content offerings like the Mount Vernon Virtual Tour, Washington’s World Interactive Map, and feature presentations The Winter Patriots we feel that we are now amongst the leaders in our digital category. Thinking about “what’s next?” we feel that as an organization we need to be far more focused on the mobile experience. 43% of our visitations to our site are now from mobile devices — up from 20% two or three years ago. It’s so tempting for all of us to view our websites on large desktop screens, but so many of our visitors discover us on their phones or tablets. 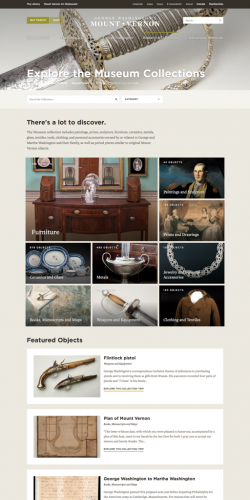 Our new website, with its responsive design, is a vast improvement over our previous site, but I do feel that there is much more we need to do on mobile. Maybe it’s time to throw those desktops in the trash? Tracey It was a fun, exciting project, and we’re really proud of how it turned out. So, I really wouldn’t change any of what we did with the website. But knowing what we know now about mobile and seeing that increasing rise, there are a lot of cool ideas around the idea of location and physicality that might come into play. It’s interesting to think about how a smart phone can connect people with digital content as it relates to physical location. I don’t think there’s anything I would change for a user who’s sitting at a desktop in London learning about Washington and Mount Vernon. But for the person who is in D.C., or who is 500 feet outside the gate, or who is walking the grounds, there’s a lot more that I’d like to see us do. The technology’s getting there — I think we’re going to see exciting opportunities to start using things like iBeacons and location-aware information that will gently engaged with a user in ways that are useful to them through their smartphone. It’s interesting to think about how things might evolve for places that have a physical experience and a digital presence online. Much of the success of this project seems to be tied to the very positive and successful working relationship between two teams. What makes a good client? What makes a good consultant? What worked well? Tracey Well, to have a client who’s passionate about the project and the place is inspiring. Rob brought great past experience in the digital space and the realm of historical places and institutions to his position at Mount Vernon. He and his extended team were great partners because they pushed us, asked us questions, collaborated with and supported us. They didn’t treat us like a vendor, they treated us like a partner. That always gets the best work out of our team. At the end of the day, everybody at Fastspot is a creative soul and they thrive on that kind of a relationship. RobWe studied Fastspot before we ever spoke to Fastspot, and so we had a sense of their design portfolio and their design skills. Our first meetings were so encouraging and respect for Fastspot’s knowledge and talents rose quickly. I’ve worked with many design firms in the past and some are great at design and others are great technically. But in Fastspot’s case you really have a team that is excellent in so many important ways – design, technical development, content strategy, and project management. 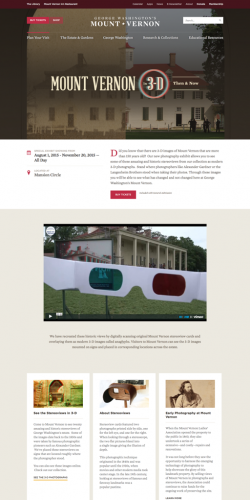 I think with Fastspot’s help, we finally were able to create a website that could convey the physical beauty and the rich history of Mount Vernon to a worldwide audience. Through this new website and its modern design, we feel that we are now in a far better position to engage and attract a new and younger audience of digital natives. And for Mount Vernon and the Mount Vernon Ladies’ Association, an organization that has been around for more than 160 years, encouraging a deep appreciation for George Washington in every new generation has been at the very core of our long existence.